CHRISTMAS MARKET B&B SPECIAL FROM €89 TOTAL! 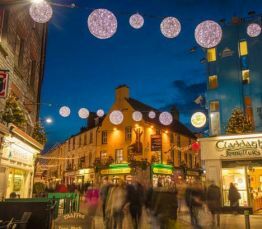 Take in the festive atmosphere this Christmas with a shopping trip to Galway to visit the popular Galway Christmas Market which is returing from Friday 16th November - Saturday 22nd December 2018. This package includes Bed & Full Irish Breakfast in our Bay Brasserie plus a Complimentary Irish Coffee per person. Valid on selected midweek nights in November and December. Guests can avail of complimentary car parking and access to our leisure facilities. Additional charges apply for children's bed & breakfast. Valid on selected midweek dates between 18th Nov - 20th December 2018. Includes one complimentary Irish Coffee per person per stay.